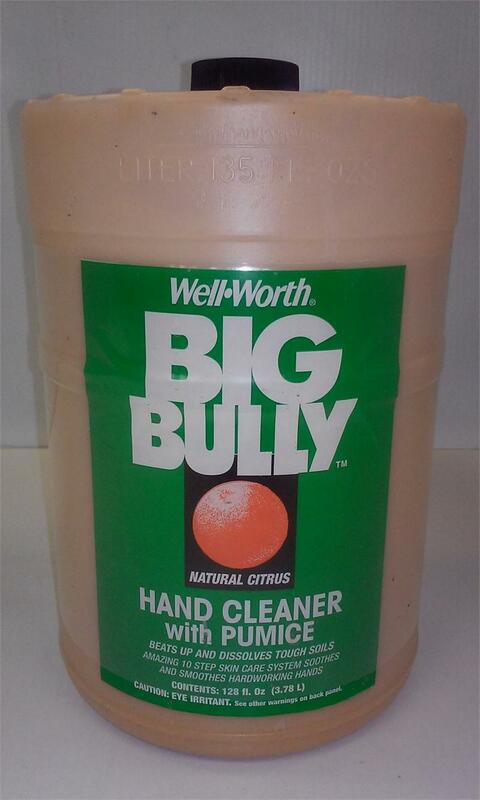 Automotive Dealer Supplies > Soaps, Cleaners & Specialty Products > Big Bully Citrus Hand Cleaner 128 oz. Big Bully Citrus Hand Cleaner 128 oz. The Big Bully™ hand cleaner line offers a wide choice of cleaning options and skin care to meet individual needs. All the hand cleaners are anti-bacterial and biodegradable with a 10 step skin care system to smooth hardworking hands. Wheat germ and 5 botanical extracts enhance the absorption and conditioning performance. None of our cleaners contain the known carcinogens DEA, NPE’s or PCMX usually found in cheaper brands. All hand cleaners except one contain either fine pumice or plastic scrubbers for extra cleaning. Available in a variety of container sizes designed to be used with custom wall dispensers or pumps. Sample sizes available.